‘Kat’, in the northern dialect, means marketplace. 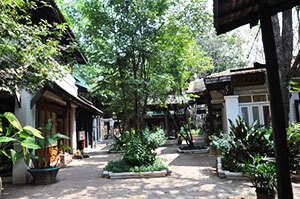 The bazaar is a part of the Oriental Dara Tewi Hotel, located on the Chiang Mai – San Kamphaeng Road. It covers approximately 1,500 sq m of ground, full of trading space and shops. Many shops along the roads are built in the charming wooden shop-front style of the ancient Lanna Kingdom of Northern Thailand. Others showcase Lan Chang architecture from Laos and Northern Thailand, a truly unique and beautiful style of wooden houses, and still others were built according to Sip Song Pan Na style from Southern Yunnan or else in Burmese Mandalay style. Quaint, unique shops sell local products such as silk and other cloths, decorations and crafts, as well as replicas of antiques. Visitors can find photo studios offering costumes and scenes from Lanna, and take home amazing photos of themselves lounging in the ancient past in full costume. The market is full of restaurants, food stalls and bakeries, as well as space for outdoor activities. For a break from the race, find yourself a cute little pavilion next to a pool or garden, or take a stroll along gentle paths, accompanied by peaceful Lanna music. All in all, the bazaar provides a lively atmosphere spiced with Lanna traditions and style, blended comfortably into the natural environment. For more information, Tel. 0 5385 0111.